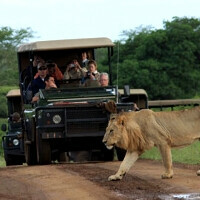 Africa is not just breathtaking scenery and bored lions trying to keep those annoying flies away. If you happen to live in one of its cities with your Android device you'd undoubtedly noticed that there are no pedestrian navigation options in Google Maps. Until now, that is, since Google announced it has added 44 African countries to the places where you can trot slowly around the neighborhood sidewalks, guided by your Android gadget. The car and pedestrian navigation options differ, since the speed of travel is much slower when you walk, and the readings from GPS satellites have to be realigned to reflect that. Google Maps Mobile is also receiving the African pedestrian option, of course, and Google made a screenshot where the option resides in the app's settings, with the usual warning that the service is still in beta, and if you spot a missing sidewalk, you can edit the map to add more details for your fellow pedestrians. Only thing left now is a Street View image of a pack of lions.